"I cannot make this delicious soup often enough for my daughter! 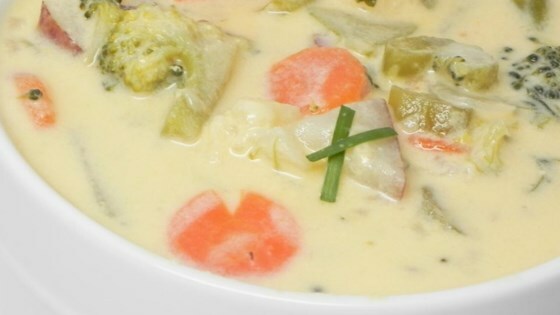 It's creamy smooth with chunks of veggies." In a large pot boil the chopped celery, chopped onion, potatoes, mixed vegetables, bouillon cubes and water until all the vegetables are tender. Add the Velveeta(R) milk and butter or margarine. Heat until hot and serve. See how to make quick-and-easy cheese soup with broccoli. This was very good, and very easy to make. I love soup, and this one was just perfect. Delicious! I added some fresh thyme and zucchinni; sauted the vegetables in fresh garlic and evoo. Warm and comforting especially when it was all I had in the house. Thanks. This is a great, easy recipe! It freezes very well, too. Highly recommended. Ive made this soup a few times with several variations such as adding some leftover Bruschetta chicken or mashed potatoes to thicken it a bit. Its always a hit at our house!